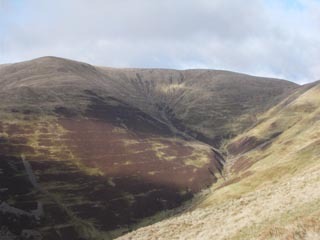 The Howgill Fells are relatively remote steep sided grassy hills, rising to just over 2,200’, between the Lakes and the Dales. This circular walk in takes in their western flank and the two highest summits, The Calf and Calders. It has fine views on a good day to the Lake District. Approaching these hills from the west means that the drive up the M6 is relatively rapid and allows this hills to be walking in a day trip. The plan is to meet for a 10.00am start at a grassy area where cars can be parked at Fairmile Gate, which is on the minor road ‘Howgill Lane’ between the A684 and Low Borrowbridge. GR is 629977. Car parking here is limited so please try to share lifts as far as possible.